Exterior Remodel & Design offers the Omaha and Lincoln areas complete roof repairs. We service both commercial businesses and residential properties. If you are in need of any type of roof repair or Re-Roofing give us a call today. Exterior Remodel & Design offers the best prices in the Omaha and Lincoln areas and we are licensed, certified, and insured. With many years in the roofing business, we are the number one choice for all roof, window, and siding repairs and installation. 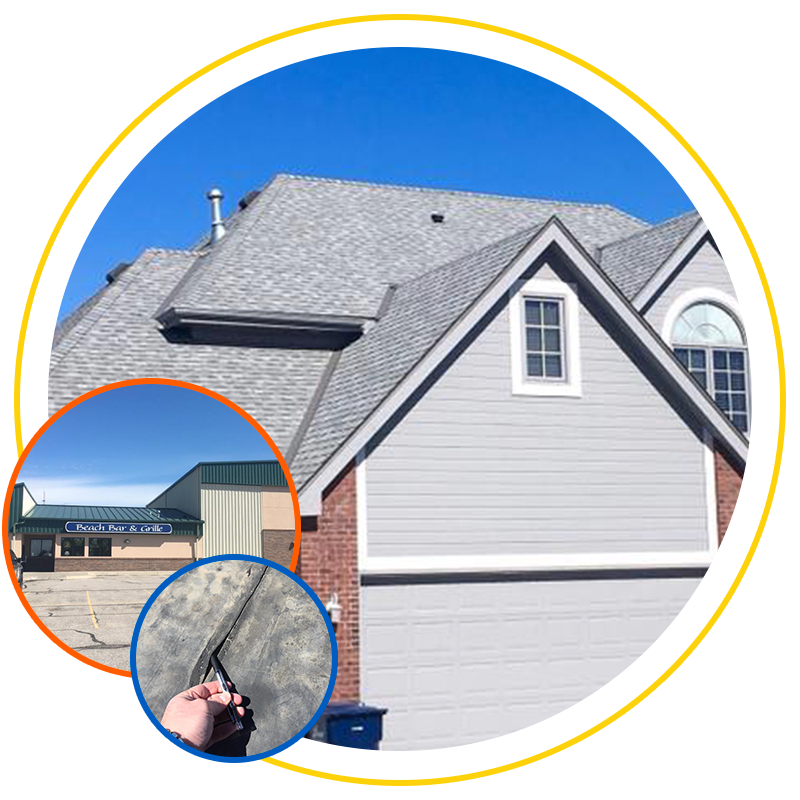 Many companies only cater to one or the other, but Exterior Remodel & Design offers our roof repair and Roof Installation services to both residential and commercial businesses in the Omaha and Lincoln areas. Our skilled roofers are certified to work on both commercial and residential properties and knows what products are the best for each situation. Replacing a roof is a huge financial decision, and our experienced roofers will help make sure you get the most bang for your buck. With the high quality roofing materials we use, coupled with our expert installation, we’ll be able to provide you with many years of protection. In fact, all of our shingles come with manufacturer warranties from 25 years to lifetime. With that kind of quality, it may be the only time you ever need to replace your home’s roof while you live there. Exterior Remodel & Design has become a well-trusted name when it comes to roofing in Omaha, because we are willing to work with our customers and always take pride in doing a job the right way. Our roofers are always updating their knowledge of the industry and strive to leave customers as pleased as possible with their new roof. These are only a few of the many options we have. We offers all types of roofing products to our residential and commercial businesses. If you are looking for a new roof, re-roof or need to replace an old one, look no further than Exterior Remodel & Design. We know we have the right choice for you. Most roof damage comes from hail and wind storms. Nebraska is known for its bad weather and with bad weather sometimes comes damage to our homes. The number one roof repair in the Omaha and Lincoln areas is shingle replacement or re-roofing. Shingles can become worn and loosen from high winds. If you do not replace the shingles, you could be risking your home or business having a leak. Once a leak happens, you will end up spending even more money to fix water damage and roof damage. Other types of damage can come from hail, ice, and trees. If you have any type of storm damage, give Exterior Remodel & Design a call today. We offer free estimates and some of the best roofing rates in the area. Roof repairs go from easily replacing shingles to needing whole parts of your roof rebuilt. Storms are the number one cause of roof damage. Wind, hail, and even trees will cause damage to your Omaha home or business. It is Exterior Remodel & Design’s job to be there for you in your time of need. We offer complete roof repairs and our rates are very reasonable. We repair all types of roofing as well as replace and repair gutters, siding, and windows. If you have experienced roof damage from a storm don’t hesitate to call us today. We will even help with your insurance claims. When it comes to protection from all that Mother Nature throws your way, your roof is your home’s primary defense, which is why you want to be sure your roofing is made of high quality materials and installed by professionals you trust to do the best job possible. Here at Exterior Remodel & Design, we have a team of the best roofers in the Omaha area who consider your needs before suggesting a specific type of roof. Our team of roofers can install, replace, and repair any type of roofing from natural slate to concrete, clay tile, sheet metal, cedar roofing, and more. As trusted window specialists in both Lincoln and Omaha, we pride ourselves on our level of expertise and our willingness to exceed our customers' expectations when it comes to installing and replacing windows. Protect your home from the elements, avoid water damage, increase your resale value, and instantly refresh the look of your home with new siding and gutters installed by Exterior Remodel & Design.